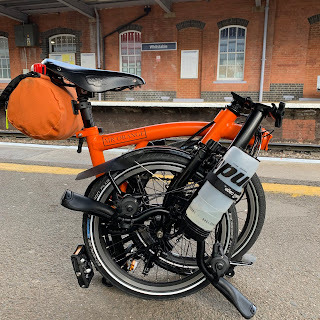 My Orange Brompton: London to Brighton in the wind and rain!! London to Brighton in the wind and rain!! This weekend was always going to be memorable. It was always going to be a Bromptonfest but little did I appreciate what a weekend it would turn out to be! It started Friday evening when I cycled to Charing Cross railway station to meet veteran of many a long distance ride, Geoff just before 23:00. We were of course attendees of another fantastic ride to the coast. Again, I came to the conclusion that I have lead a fairly sheltered life and the sheer range of outfits worn by many either heading out for a night on the tiles or those who were going home, was nothing short of astonishing! One chap strolled across the station wearing a pair of jeans with the buttocks cut out. He was in his 40's, overweight and should have known better. Another lady wore a dress that must have been made out of a couple of small face flannels stitched together. I would have liked to have taken photographs of both but thought better of it as I had a ride to attend and didn't want to be beaten about the face and neck! Thankfully Geoff arrived and we headed to Victoria to meet up with Bob and a few other riders before heading out to Hyde Park Corner. When we arrived there seemed to be less riders than usual. This was almost certainly due to the fact that the forecast for the weather was not good. This was a factor in Andrew's last minute non attendance. Exactly at midnight we headed off. The rain was already falling, gently and my waterproof jacket was on. With the Thames Bridges ride taking place on Sunday and the 100 mile Mitie Revolution a week later, as I set off I made up my mind that I would ride at for me a fairly sedate pace and if we attempted the dreaded Ditchling Beacon, I would walk! Rain! I have been on a night ride to the coast where the rain was a great deal heavier but on this ride I was quite literally soaked to the skin. My waterproofs, proved to be no longer waterproof and I may as well not worn them for all the good they did. More on that later. This was a demanding ride with lots of ups and downs. I write demanding mainly due to the high winds, rain and the fact I was soaking wet. I am convinced that I was carrying possibly carrying an extra 2kg in the form of water soaked clothing. Aside from the dramas of my lack of waterproofs the ride was brilliant. Our stop off was again 'The Cabin' in Faygate. I decided to bring my own tuck but was treated to a mug of coffee from Geoff which warmed cold hands. At this point several riders decided to call it a day and headed for a nearby train station. This was mainly due to the weather I suspect and the prospect of more rain as we looked out of the window to confirm that it was indeed still raining. Bob - who had been a tail end Charlie for the ride - guided those not wanting to continue to the train station and after catching the ride up again clocked and extra 10 miles. With 25ish miles remaining we headed out to get our bikes ready for the off. Again I felt very cold. I had two pairs of gloves and after wringing out both I abandoned them for the rest of the ride. It was not too long before I heard the dawn chorus. Again I was struck by the number of Chiffchaffs singing away, usually associated with the arrival of summer! The wind started to pick up and it also picked up fine rain to make the sensation of little needles pricking exposed flesh. I had now resigned myself to the fact that I could not get any wetter and stoically was beyond being bothered. There was a good 12 mile stretch where I was cycling alone. I could see rear lights in the distance and behind but they were both a considerable distance away. I quite enjoy these times as it provides lots of reflective opportunities. I mulled over the Thames Bridges ride on Sunday, trying to calculate timings. I thought about the Mitie Revolution, its 100 miles and whether I was ready? I thought about my wife who after a kiss goodbye said that I was mad to be going out in that weather. I thought about what my next waterproof jacket and over trousers would be and whether I should also buy a pair of overshoes again? As we approached Brighton there was a last hill to climb. It wasn't the Beacon but it was steep and went on a fair bit. Geoff powered ahead and was King of the Hill as not a foot hit the ground. I stuck to my plan and walked. I hated every step but know that my legs didn't have it in them for this and Sunday's ride. On the outskirts of Brighton I saw a considerable amount of advertising for 'The Moscow State Circus' and 'The Ladyboys of Bangkok.' I imagine the Circus is all figure hugging lycra, sequins and heavy make-up. I suspect 'The Ladyboys of Bangkok' is much the same. Reaching Brighton was a relief and as it was still raining Geoff and I said our goodbyes and headed for an indoor alternative where we got a full English breakfast. Feeling refreshed we headed for the station and home. We arrived at Victorian in good time and headed for Hyde Park. Once in the middle of Hyde Park Geoff and I said our goodbyes and parted company until next weeks Mitie Revolution. This was another great ride. Cycling can and should be done in all weathers and it is poor equipment that usually lets one down. I will be buying some new equipment and will try and get it in time for next week - just in case. The map and ride data can be viewed by clicking on the link below. You did good on this one, I never would have made it with all that wind and rain.